Rio Tinto has unveiled the world’s first coin featuring a rare red diamond from Perth’s Argyle diamond mine. Dubbed the ‘The Kimberly Treasure’, the coin is made from one kilogram of 99.99 per cent fine gold inlaid with the 0.54 carat red diamond. It depicts a circular patter of sunbeams around a jumping red kangaroo holding the gemstone in its two front paws. It is selling for $1 million. The coin is legal tender, and was unveiled by WA premier Colin Barnett. “The Perth Mint and Rio Tinto’s Argyle mine have both been at the hub of Western Australian industry for decades, so I am delighted to unveil a collector’s item which captures two of the most beautiful treasures of our state,” Barnett said. Managing director of Rio’s diamonds business Simon Trott said the coin is “a beautiful symbol of the unique treasures of Western Australia and sets a new benchmark in limited edition craftsmanship”. 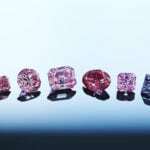 The Argyle mine produces rare pink and red diamonds, with an average of one carat of red diamonds produced per year. Last year the mine collaborated with the Perth Mint to produce a rare pink diamond coin featuring a high relief of a boab tree amid a Kimberly landscape at sunset. The diamond was embedded near the horizon to depict the setting sun. It was the first coin to use Argyle diamonds, and retailed for $8800.